Almost everybody on this forum is subscribed to a thread or two. However, for some time now, say I get 7 alerts – when I click to see only 1 or 2 appear (in most cases 0). Another thing is I don't always receive an alert of new content from subscribed threads but know there are new replies. 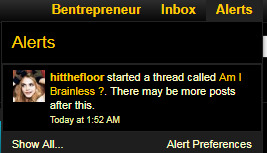 If I find the thread through the forum manually and upon my next login, I get alerted for new content.